If I were to name an author whom I considered to be one of the greatest living writers of fantasy Neil Gaiman would be just that author. He drives the genre forward by anchoring the majority of his tales in reality and then warping the world around his characters creating something that is very much fantasy at it’s finest. 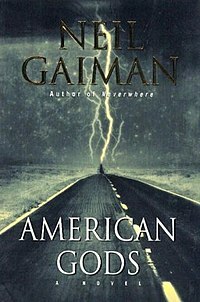 Gaiman has written a wealth of novels in this style and ‘American Gods’ is arguably the greatest of these. Set in modern-day America the book focusses on a main protagonist that has just been released from prison to find his girlfriend dead, this however turns out to be the least of his worries as he is soon drawn into a battle between Gods both old and new. ‘s style is what carries this book, the way he crafts a dark and vivid world whilst still populating it with believable and humourous characters. Within ‘American Gods’ Gaiman draws upon ancient Norse lore to give it a grounding in existing knowledge while at the same time weaving a rich new universe where Gods are not all-powerful. Gaiman does the genre of fantasy a great service in shaking of the Dungeons and Dragons stereo-type that it has developed over recent years with his brilliant fantasy novels. I would recommend ‘American Gods ‘ to anyone who loves modern fantasy and is looking for something dark and original. I would also say that buying the unabridged version is a necessity; I give it 5/5 stars.